Fit for Success: MOTIVATE YOURSELF! This is something I often ask myself. First of all, what is attainable? 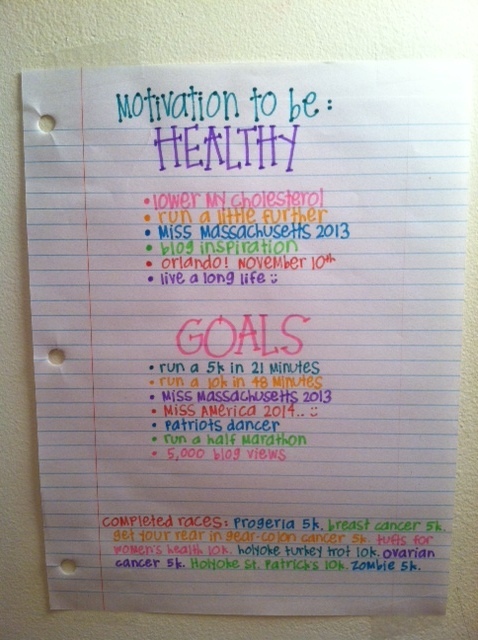 It is important to set realistic goals in order to keep yourself motivated. If you've never ran a step in your life and hope to run 10 miles by tomorrow, it probably won't happen (safely). How much time do you have to achieve these goals, or is it ongoing? For example, do you want to run a 5k by November, or do you hope to make your life "healthier in general" over the next year? Next, how are you going to stay MOTIVATED?! We all hear of the New Years Resolution people who sign up for gym memberships, use them for a week, and never return........ until the following January. This will NOT be you! Especially with a few of these tips! 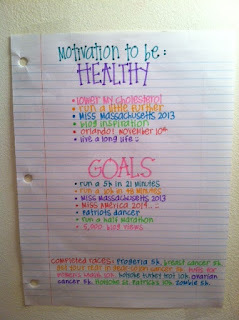 Now, keep in mind that everyone is motivated differently, I just found these to be helpful for me! Once you identify your goals, you can twist these tips into motivators that work for you! While this might be a little overboard, it definitely helps me! 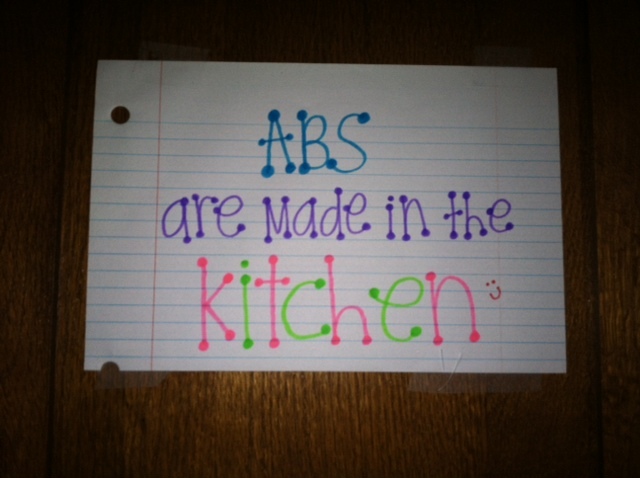 I literally have this homemade sign hanging in my cabinet. When I'm about to go back for a 10th bowl of cereal (haha) I look at this sign and realize... is it worth it? Will this help to "shape" my abs? Probably not. 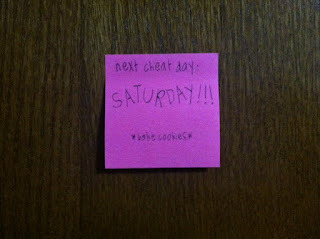 Sometimes I hate this sign, but some day when I have a 6-pack, I know it'll be worth it! 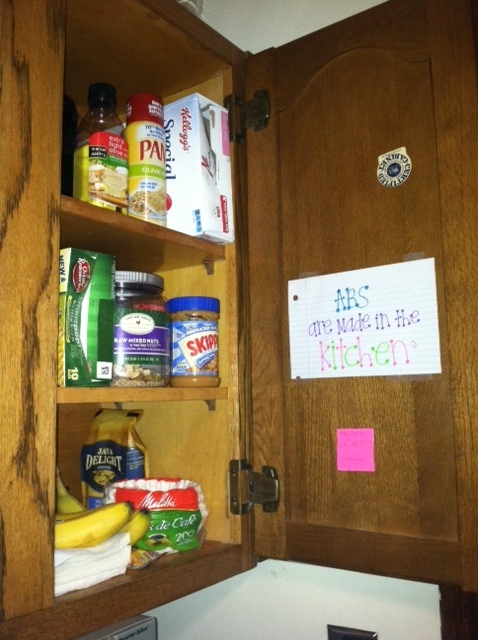 Next, I keep myself motivated by filling my cabinet with mostly healthy foods. If you buy junk food, you will most likely (definitely) eat it! So save your money and save yourself from having to postpone your goals! 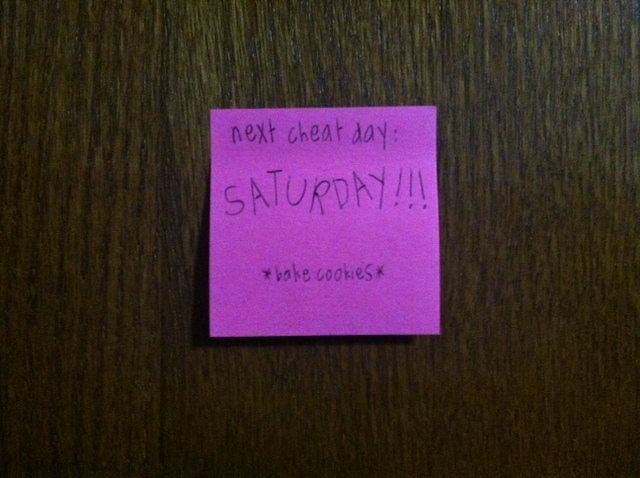 Don't forget about the cheat day you should have once a week to keep your metabolism going, your body guessing, and your sanity!!! This is the easiest thing you can do. WRITE DOWN your goals! 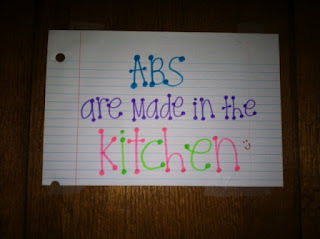 I have this hanging above my mirror so I see it every day! It helps to keep me on track and it gets me excited to live another day healthfully. 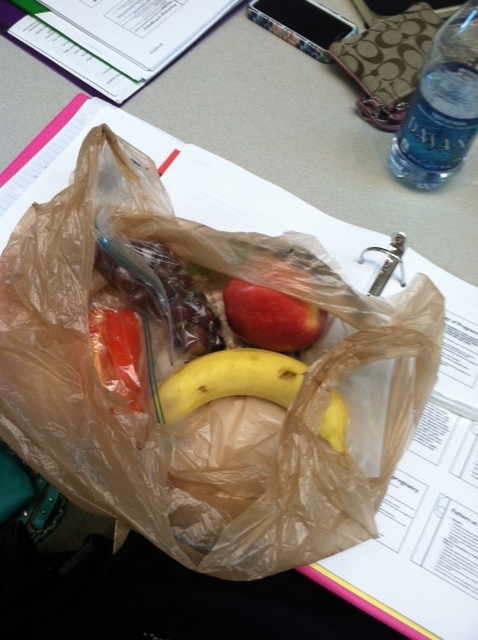 Stay motivated by packing your lunch and snacks! That way you won't be tempted by the Burger King line at UMass Boston every day... I realized that this is what I packed for my study session today, and it tasted great! 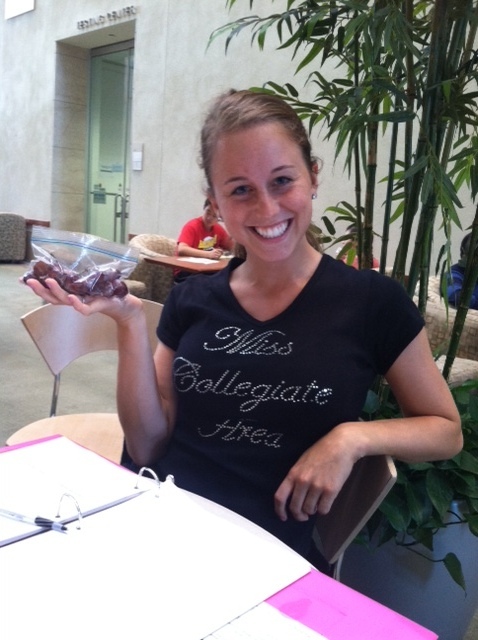 ...... And then we realized I was wearing my "Miss Collegiate Area" t-shirt so we figured this was a picture-worthy moment. FIT FOR SUCCESS REPRESENT! Ps- those grapes were delicious. Thanks for the cheesy picture, Lisa! 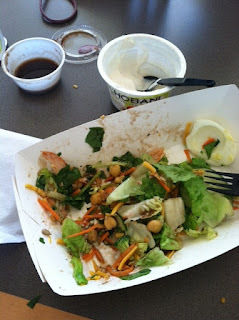 Lastly, when you are feeling extra tempted by fast food, at least go for a salad and a yummy-tasting yogurt! My lunch today included a huge salad (already half-eaten in this picture.. guess I was too hungry to realize I should have taken a picture at first) and my Apple-Cinnamon Chobani was like dessert! So delish!